How could this be true? Crossing Bass Strait for the second time meant six months had just evaporated, barely a thought or two in the lives of others and maybe not that much different in ours but mountains of really great stuff were crammed in there. This story is only a few brief words about the last 48 hours, leaving the wonderful Tasmanian farm and arriving at our new assignment, Nyora in Gippsland. 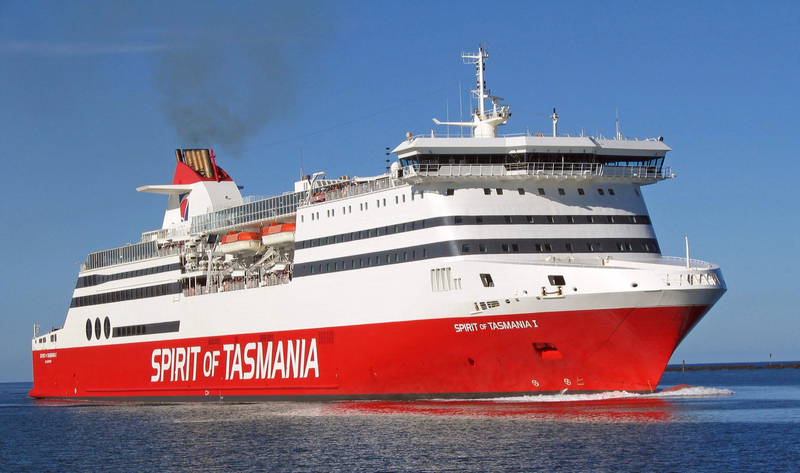 The night return trip, from Devonport in Tasmania to Melbourne on the refurbished Spirit of Tasmania was largely uneventful except for the intervention of a ‘security officer’ who, after frisking me with his magic wand, told me I could not take my pocket knife into the passenger area with the Kafkaesque explanation that ‘I might stab someone’. I asked if we had to eat with our hands on this trip, was there no cutlery? Would we be unable to find a knife and fork? This is the ‘finger food’ trip? The presence of thousands of knives and the accompanying four pronged forks in the dining areas was clearly nothing compared to the looming danger of my pocket knife. As it was, the refurbished ferry, the food, the accommodation and the service were all beyond criticism. The wake-up announcement at five-forty-five was easy-going and barely needed, keen as we were to disembark and re-join the masses on the ‘Big island’. After a breakfast of cereal and coffee beside the park, a few kilometres west of the Melbourne port, we joined the Eastern Freeway to partake in jostling with mighty trucks and a few dodgem cars but we emerged in the south east to one of those ‘special moment’ morning drives. The air was cool, the sky was blue, the sunshine warmed our faces, the motor hummed along and adventure beckoned. We’ve enjoyed a few memorable morning drives like this, including one in Italy, two life times ago is seems. Little had changed in the last 6 months at the Lang Lang Caravan Park. That statement could probably be equally true if I substituted ‘6 years’ or maybe even a substantially longer period. It hardly seems six months since we were here, excited about the prospect of an adventure in Tasmania and busting to get on board our first ferry crossing of Bass Strait. This time, the place was almost deserted and we were invited to ‘pick a site’. There had been a lot of rain in the preceding days so slightly boggy ground was in evidence but we chose a spot on the water front not far from the facilities. ‘On the water front’ is not quite an accurate description for long periods of each day on Western Port Bay, the water being quite a distance from the ‘front’ part of the equation. We’d arrived at the seemingly presumptuous but prearranged early hour of 9am, having left the ferry at seven and taken the freeway east and south to find ourselves in the countryside two hours later. The ocean was nowhere to be seen but I had it on good authority it would return in due course. By three thirty in the afternoon my faith in human nature was vindicated and the water was back. We just sat in the warm sunshine of this second day of a Victorian Spring but by the time the sun was setting and the cool air of a light breeze was gaining preeminent ground, the water was once again retreating. We retreated too, to the relative warmth of the temporary walls we’d erected around the awning attached to the side of our camper van. Memories seem to choose us, not the other way round. I’ve always thought it strange that certain unimportant memories linger for decades, while often important events slide into obscurity. The chance discovery that putting a blanket over the table turned our little electric heater into a heat source similar to a blast furnace was exciting. Tucked up close in our coats and blankets watching a favourite TV show in a campsite on a cold Spring night, hopefully it will be one of those memories that linger. The tide paid another visit through the night, lapping against the stone wall to reassure and lull one back to sleep. The next morning dawned with the slightest of breeze, warm sunshine and mostly clear blue sky. 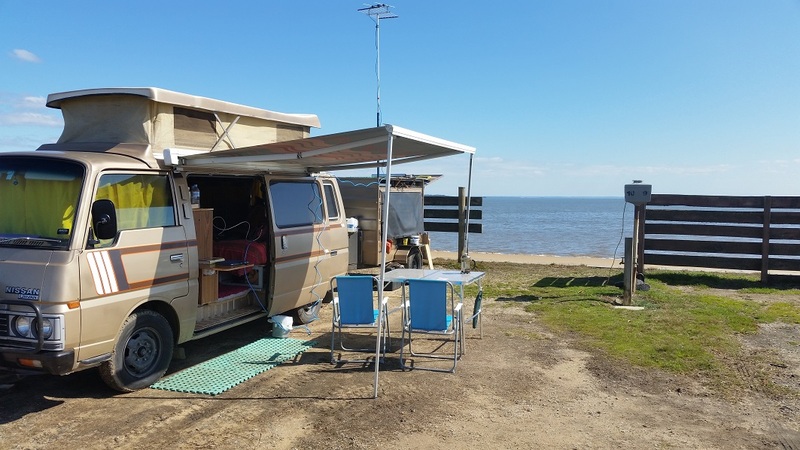 We wantonly revelled in the unhurried pleasure of having no commitment past meeting our new hosts mid-afternoon in Nyora in the Gippsland hills, barely a dozen kilometres from where we took our leisurely breakfast and stared meaningfully out to sea. Between leaving the Tasmanian farm and arriving at our next ‘home-for-a-time’ was a short story but another nugget of memory gold. Before we proceed to the mysteries of Nyora, the full story of Tasmania has to be laid bare. It begins with a one-day drive, south of Hobart, that has marked us, permanently etched itself upon us, forever.